All photographs kindly provided by Kelly Ryan Gilliam. Benny Jesse Gilliam, an eighteen year old part-time soda jerk from Henderson, Tennessee, was inducted into the Marine Corps in September, 1943. He sped through boot camp in San Diego, and was assigned to Charlie Company, 24th Marines that December; exactly one month later, he left the United States aboard the USS DuPage and sailed directly into combat (the invasion of Roi-Namur in the Marshall Islands). Gilliam would not come home to Henderson for more than two years. 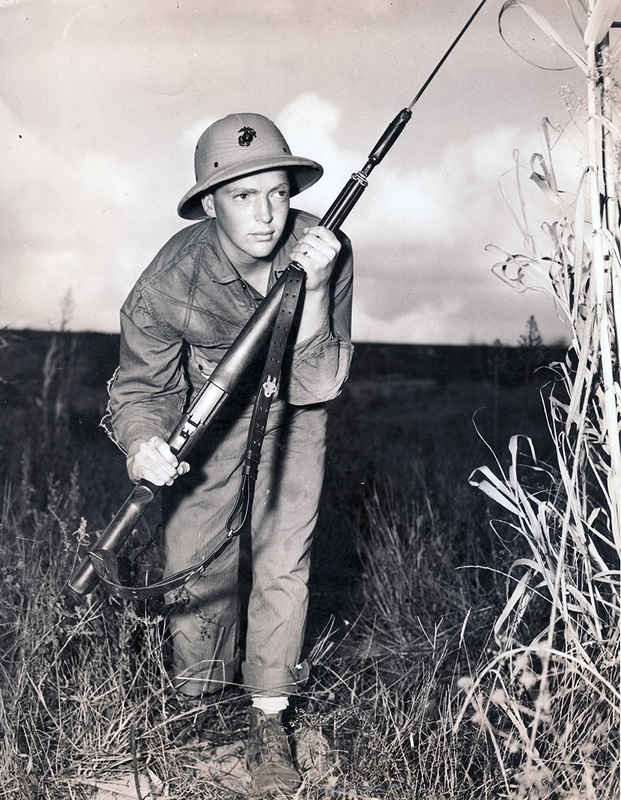 He fought in every Fourth Marine Division battle as a rifleman, messenger, and BARman until March 8, 1945, when a shell fired on Iwo Jima hit him in the right hand and leg. PFC Gilliam recovered and returned to his unit in May, 1945, and was training to invade Japan when the war ended. Most of these pictures appear to have been taken after Gilliam returned to his company in 1945. Unfortunately, with one exception, the names of his buddies shown here are not currently known. Gilliam’s boot camp graduation photo, December 1943. Benny in uniform, probably in 1944. Charlie Company had a uniquely designed trash can in their company street. One of Charlie Company’s platoon sergeants. The only identifiable Marine: PFC S. D. Hall. Stuart Delbert Hall was a replacement who joined Charlie Company in April, 1945. PFC Gilliam in the company street. Gilliam at the end of the war. He earned the Purple Heart on Iwo Jima.